Over 40 and wearing Topshop....... whatever next?! There are still some people out there that think us women of a certain age should be packing away our trainers, off the shoulder tops and skinny jeans and swopping them for twinsets and pearls. Hell no, not me. Okay so I may not be a skinny young thing anymore (age is a cruel thing, the weight just creeps on as you get older, and you have no idea why or where from!) but I will always wear what I like and feel comfortable in, NOT what some in society say we should be wearing 'at our age' as I've already said in this off the shoulder post here, have a read! Anyway, back to the OOTD and our trip into London, I make it sound like we live a hop, skip and a jump away, we don't, it's a good couple of hours away by car, but Nick and I will often decide on the spur of the moment to drive down if we've got nothing else on, and besides at the weekend you can often get free on street parking in our capital or for peanuts anyway, which is more than we can do in our own city in the Midlands, robbing dogs! 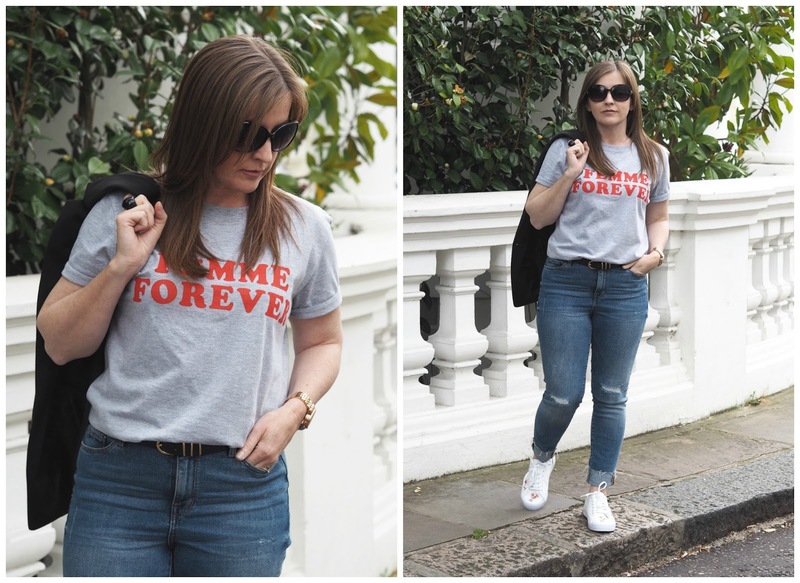 For me the slogan tee from Topshop is the star of the show and I love it and who's not wearing one these days? Sorry about the creasing down the front but I was in the car for a while! 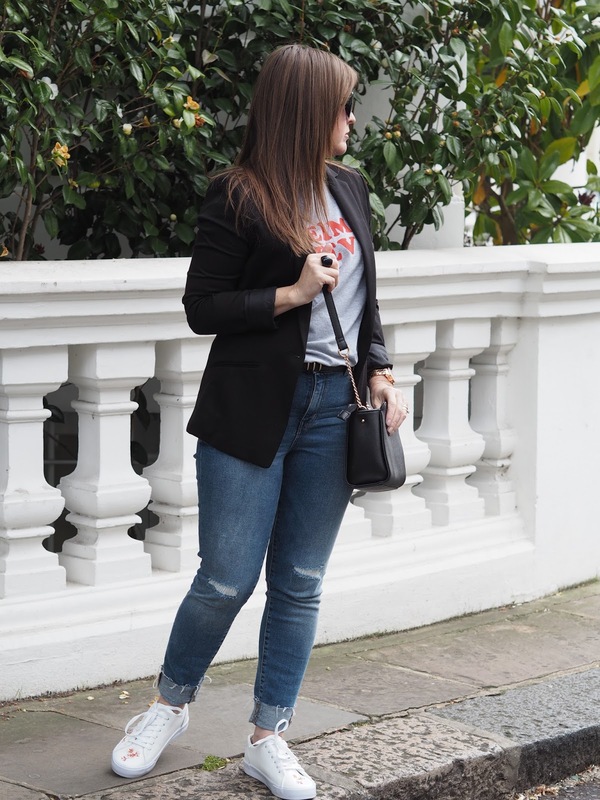 AND, I then had my legs around my neck and at one point I'm sure out the window trying to change my jeans in the back of the car, the things us blogger do hey?! It's slightly oversized for a more loose, casual fit and it's long enough to tuck into jeans without it coming untucked every five minutes. It's super comfy and with longer sleeves too, I hate those shorter, more cropped sleeves on a t-shirt, I need long to hide those bingo wings, another thing that's crept up on me as I've gotten older :( Oh how I wish I'd kept going with those tins of beans! If you fancy the tee, and are ordering online I find it's true to size and pretty good quality. A bit of a 'spur of the moment' purchase also in Topshop this Easter weekend were these little beauties on my feet. 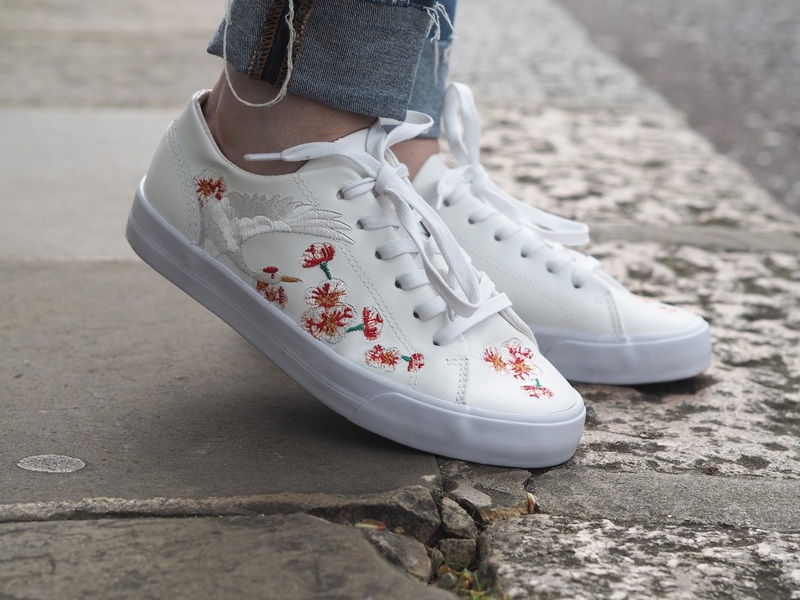 Eye-catching white trainers with the prettiest delicate embroidery. 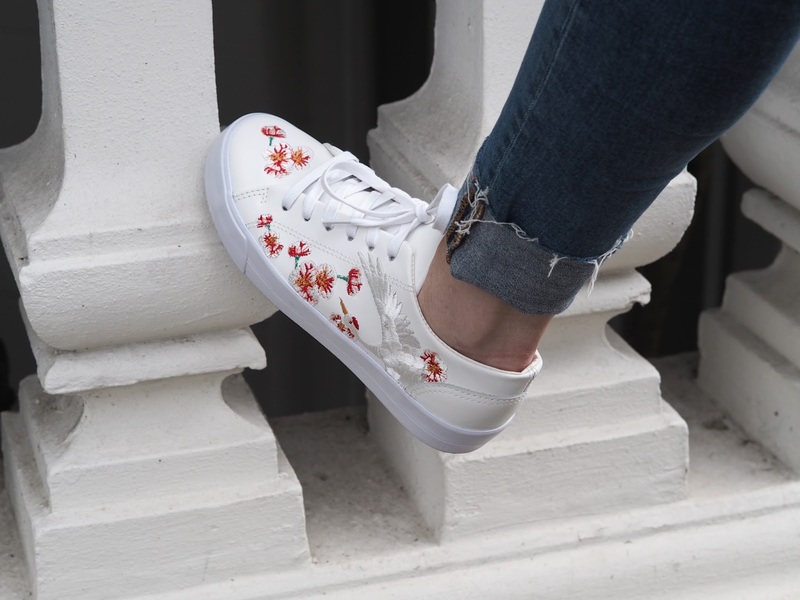 Embroidery is everywhere at the moment isn't it, from clothing to bags to shoes and it adds a little something to your outfit. My choice is to wear them with jeans for a more casual, laid back look but they'll look fab and make a statement worn with a pretty little dress too. Sadly, I can't find them online so you'll just have to go in store to pick yours up. They're £39.99 and they are leather. I've found some similar ones that I've linked down below and they're a bargain too. The jeans are ones I picked up recently and wore to death on our recent trip to Palma. So there you are, my latest Topshop pieces. It's a shop I love, and will continue to shop in, it's not just for the 20 somethings, in fact, whilst I was in there I saw a woman who must have been late 60's at a guess, and my God she was trendier than me, not that I'm particularly trendy or anything! I just watched her, admiring her style as she flicked through the rails, and I muttered to myself "girl you rock!" Are you on board with the embroidery trend? What have you purchased? LOVE this outfit Steph! I'm really into the embroidery trend - I bought some red embroidered mules from M&S recently...I just need the flipping weather to perk up so I can wear them! Paying for parking in cities is beyond a joke - Manchester costs a fortune, and even Chester is about a tenner if you want to spend the best part of the day there. I wouldn't mind if the trains were convenient and reliable. Hurrah for online shopping! I have embroidered jeans, but had to get them from M&S, I don't seem to fit in TopShop stuff any more, sadly. I'm not an unusual size, but I think a 20 year old size 10 and a 50 year old size 10 must be different shapes. It's as though I've got the same amount of stuffing, but it's all been redistributed. Love love love this outfit Steph! I think it's a sign of a good shop when it caters for everyone regardless of age. I will NEVER be a twin set or pearl wearer! Love the tee though. Exactly how I'd style it. The trainers look fab on you, however, not something I'd purchase. I haven't really jumped on the embroidery trend..
Great post! I love a good tee! and totally have to have long sleeves too these days, really gone off the capped sleeves! This ones a beaut! Oh and your shoes OMG! absolutely gorgeous! !